My husband recently visited his family in France, but unfortunately due to scheduling conflicts I didn’t get to go with him. To make matters worse he sent me daily updates of the amazing cathedrals, vineyards, and museums that he had visited, as well as photographs of each decadent pastry and dessert he ate. Jerk. As a small consolation to missing out on the fun, he brought me back a bottle of Champagne and a tin of Biscuits Roses de Reims. American Translation: Pink cookies from the city Reims. Reims is a city located in the Champagne region of France. The region of Champagne, unsurprisingly, is where true Champagne comes from, as opposed to sparkling wine which is essentially Champagne (though my husband would disagree) that is produced in a different area of the world. 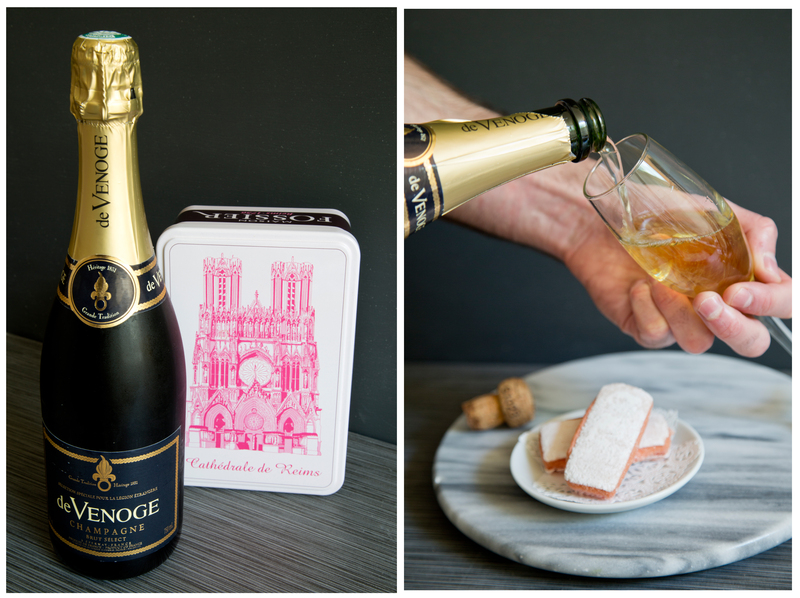 Technically, sparkling wine should not be called Champagne unless it comes from the Champagne region of France. It makes sense. 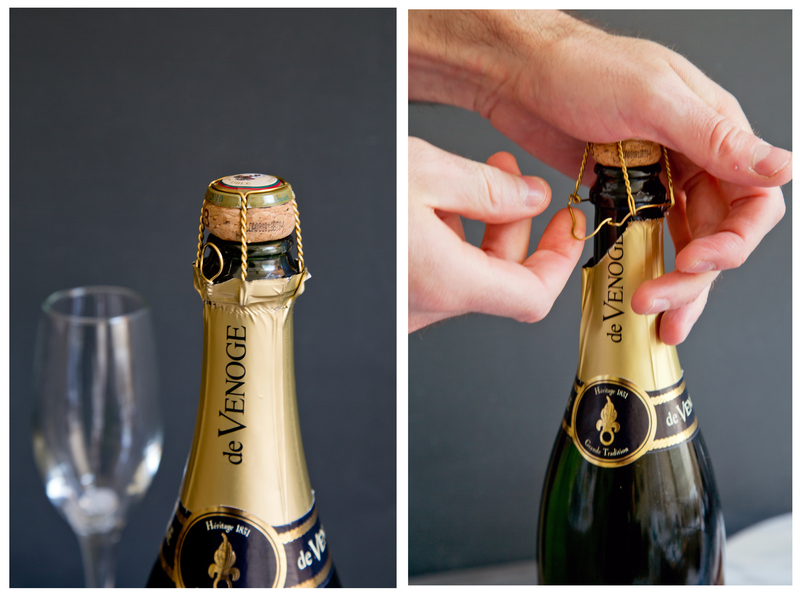 Always hold the cork when opening Champagne or you could put an eye out! 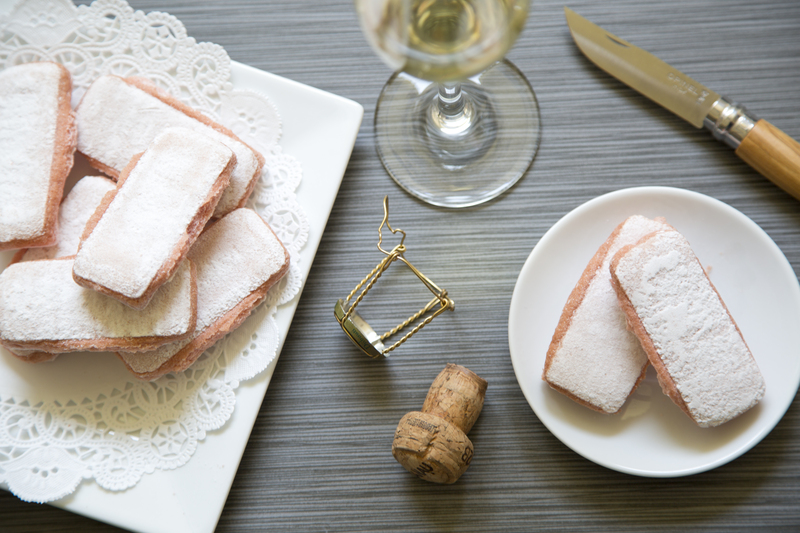 The biscuits roses are delicate, sweet cookies, dusted with sugar and are meant to be dipped in a glass of Champagne, hence their popularity in Reims. They are made with very basic ingredients: sugar, flour, eggs, vanilla, a raising agent and the pink coloring cochineal (which is made from insects), but they are delicious! 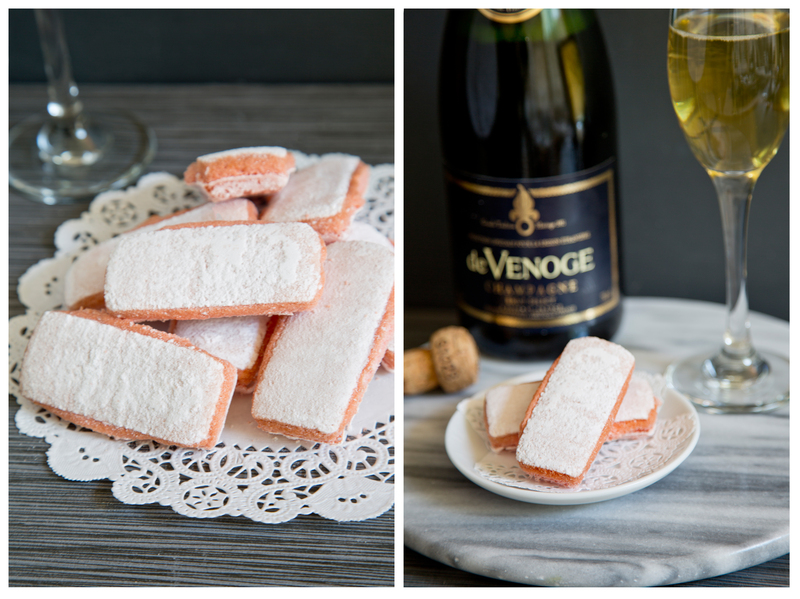 Any dessert that is to be enjoyed with Champagne is alright by me. I had the Fossier brand of the biscuits roses. 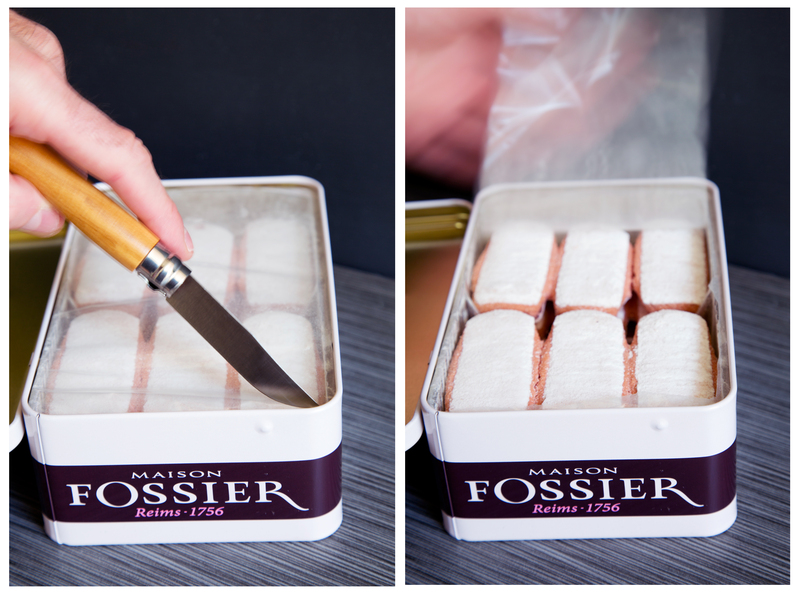 Fossier has been producing these pink treats since 1756! In 1756 America was still under British rule. France was 37 years away from beheading Marie Antoinette. It was also the year Wolfgang Amadeus Mozart was born and the year that the British and the French formally started the 7 Years’ War. Amazing, the french were engaged in war, but still had time to invent an amazing cookie. The biscuits are pink because original the baker added vanilla to the recipes for taste, but it caused the white cookies to have unappealing brown spots on them. To remedy this problem the baker added pink coloring to mask the brown and a lovely dessert was born. Categories: Travel | Tags: 1756, biscuits, biscuits roses de reims, champagne, cookies, cookies to enjoy with wine, dessert, foster, france, French Dessert, pink dessert, reims, roses dessert, thejealouscrumpet | Permalink. It would have been fun to be in France but what a lovely gift. The cookies are so beautiful and delicate. Love pink, and that champagne is excellent. I have had and its wonderful. They were delicious as well. We ate them way too quickly! Thank-you! If you can get your hands on some I highly recommend them. They were stunning! Aouch…..so sad for this time…..I am sure you will enjoy it twice stronger on your next visit to France…. Thank you for your post though….! I will! I always love going back to France! I had never heard of it either, but any time you can combine spirits with sugar I am all for it. They were quite lovely.